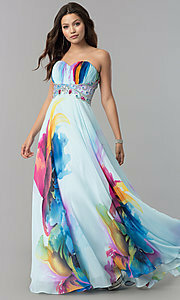 Unfortunately, the dress you are looking for (Style: DJ-3362, Name: DJ-3362) is no longer available. Wearing this long print prom dress by Dave and Johnny gives the impression of an objet d'art come to life. 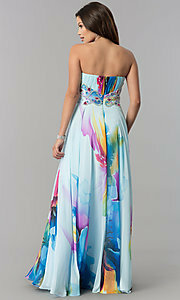 A multi-colored abstract print on this strapless-sweetheart formal dress is reminiscent of watercolor works of art designed for admiration. Glistening jewels, beads and rhinestones swirl around the empire waistline adding to the masterpiece that is this stunning designer dress and drawing the eye to this slimming feature. The ruched bodice and a-line silhouette on this junior-size evening dress also provide a figure-flattering effect for picture-perfect poses. The floor-length chiffon skirt flows gracefully with your every step like poetry in motion. Whether you plan to attend prom, gala or other formal event, this Dave & Johnny long print chiffon prom dress was made to put you in the spotlight.